Mycobacterium avium complex is a group of mycobacteria comprising Mycobacterium intracellulare and Mycobacterium avium that are commonly grouped together because they infect humans together; this group, in turn, is part of the group of nontuberculous mycobacteria. These bacteria cause disease in humans called Mycobacterium avium-intracellulare infection or Mycobacterium avium complex infection. Streptomyces griseus is a species of bacteria in the genus Streptomyces commonly found in soil. A few strains have been also reported from deep-sea sediments. It is a Gram-positive bacterium with high GC content. 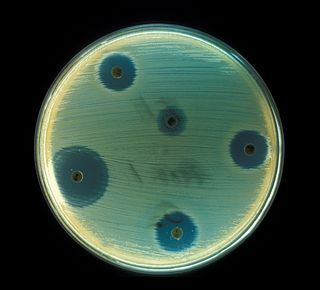 Along with most other streptomycetes, S. griseus strains are well known producers of antibiotics and other such commercially significant secondary metabolites. These strains are known to be producers of 32 different structural types of bioactive compounds. Streptomycin, the first antibiotic ever reported from a bacterium, comes from strains of S. griseus. Recently, the whole genome sequence of one of its strains had been completed. Tuberculosis in combination with other antibiotics. For active tuberculosis it is often given together with isoniazid, rifampicin, and pyrazinamide. It is not the first-line treatment, except in medically under-served populations where the cost of more expensive treatments is prohibitive. It may be useful in cases where resistance to other drugs is identified. Plague ( Yersinia pestis ) has historically been treated with it as the first-line treatment. However streptomycin is approved for this purpose only by the U.S. Food and Drug Administration. In veterinary medicine, streptomycin is the first-line antibiotic for use against gram negative bacteria in large animals (horses, cattle, sheep, etc.). It is commonly combined with procaine penicillin for intramuscular injection. Tularemia infections have been treated mostly with streptomycin. Isoniazid, also known as isonicotinylhydrazide (INH), is an antibiotic used for the treatment of tuberculosis. 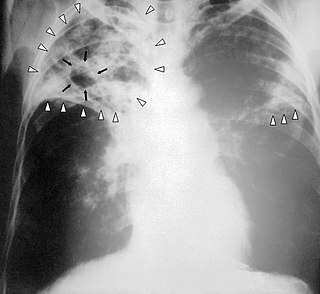 For active tuberculosis it is often used together with rifampicin, pyrazinamide, and either streptomycin or ethambutol. For latent tuberculosis it is often used by itself. It may also be used for atypical types of mycobacteria, such as M. avium, M. kansasii, and M. xenopi. It is usually taken by mouth but may be used by injection into muscle. Intramuscular injection, often abbreviated IM, is the injection of a substance directly into muscle. In medicine, it is one of several alternative methods for the administration of medications. Muscles have larger and more blood vessels than subcutaneous tissue and injections here usually have faster rates of absorption than subcutaneous injections or intradermal injections. Depending on the injection site, an administration is limited to between 2 and 5 milliliters of fluid. Cyanobacteria, also known as Cyanophyta, are a phylum of bacteria that obtain their energy through photosynthesis and are the only photosynthetic prokaryotes able to produce oxygen. The name cyanobacteria comes from the color of the bacteria. Cyanobacteria, which are prokaryotes, are also called "blue-green algae", though the term algae in modern usage is restricted to eukaryotes. Fungicides are biocidal chemical compounds or biological organisms used to kill parasitic fungi or their spores. A fungistatic inhibits their growth. Fungi can cause serious damage in agriculture, resulting in critical losses of yield, quality, and profit. Fungicides are used both in agriculture and to fight fungal infections in animals. Chemicals used to control oomycetes, which are not fungi, are also referred to as fungicides, as oomycetes use the same mechanisms as fungi to infect plants. Streptomycin is a protein synthesis inhibitor. It binds to the small 16S rRNA of the 30S subunit of the bacterial ribosome, interfering with the binding of formyl-methionyl-tRNA to the 30S subunit. This leads to codon misreading, eventual inhibition of protein synthesis and ultimately death of microbial cells through mechanisms that are still not understood. Speculation on this mechanism indicates that the binding of the molecule to the 30S subunit interferes with 50S subunit association with the mRNA strand. This results in an unstable ribosomal-mRNA complex, leading to a frameshift mutation and defective protein synthesis; leading to cell death. Humans have ribosomes which are structurally different from those in bacteria, so the drug does not have this effect in human cells. At low concentrations, however, streptomycin only inhibits growth of the bacteria by inducing prokaryotic ribosomes to misread mRNA. Streptomycin is an antibiotic that inhibits both Gram-positive and Gram-negative bacteria,  and is therefore a useful broad-spectrum antibiotic. Philip D'Arcy Hart – The British medical researcher and pioneer in tuberculosis treatment in the early twentieth century. The macrolides are a class of natural products that consist of a large macrocyclic lactone ring to which one or more deoxy sugars, usually cladinose and desosamine, may be attached. The lactone rings are usually 14-, 15-, or 16-membered. Macrolides belong to the polyketide class of natural products. 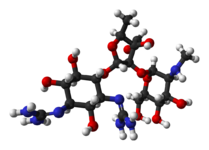 Some macrolides have antibiotic or antifungal activity and are used as pharmaceutical drugs. Neomycin is an aminoglycoside antibiotic found in many topical medications such as creams, ointments, and eyedrops. Neomycin belongs to aminoglycoside class of antibiotics that contain two or more amino sugars connected by glycosidic bonds. Selman Abraham Waksman was a Ukrainian-born, Jewish-American inventor, biochemist and microbiologist whose research into the decomposition of organisms that live in soil enabled the discovery of streptomycin and several other antibiotics. A professor of biochemistry and microbiology at Rutgers University for four decades, he discovered a number of antibiotics, and he introduced procedures that have led to the development of many others. The proceeds earned from the licensing of his patents funded a foundation for microbiological research, which established the Waksman Institute of Microbiology located on Rutgers University's Busch Campus in Piscataway, New Jersey (USA). In 1952, he was awarded the Nobel Prize in Physiology or Medicine for "ingenious, systematic and successful studies of the soil microbes that led to the discovery of streptomycin." Waksman was later sued by Albert Schatz, one of his PhD students, for minimizing Schatz's role in the discovery of streptomycin. Albert Israel Schatz was an American microbiologist and science educator, best known as the discoverer of the antibiotic streptomycin. Schatz graduated from Rutgers University in 1942 with a bachelor's degree in soil microbiology, and received his doctorate from Rutgers in 1945. Kanamycin A, often referred to simply as kanamycin, is an antibiotic used to treat severe bacterial infections and tuberculosis. It is not a first line treatment. It is used by mouth, injection into a vein, or injection into a muscle. Kanamycin is recommended for short-term use only, usually from 7 to 10 days. As with most antibiotics, it is ineffective in viral infections. Lincosamides are a class of antibiotics, which include lincomycin, clindamycin, and pirlimycin. 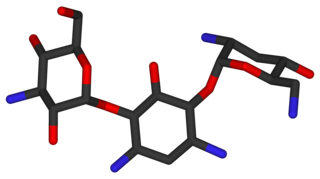 Spectinomycin, sold under the tradename Trobicin among others, is an antibiotic useful for the treatment of gonorrhea infections. It is given by injection into a muscle. Beta-lactamases are a family of enzymes involved in bacterial resistance to beta-lactam antibiotics. They act by breaking the beta-lactam ring that allows penicillin-like antibiotics to work. Strategies for combating this form of resistance have included the development of new beta-lactam antibiotics that are more resistant to cleavage and the development of the class of enzyme inhibitors called beta-lactamase inhibitors. Although β-lactamase inhibitors have little antibiotic activity of their own, they prevent bacterial degradation of beta-lactam antibiotics and thus extend the range of bacteria the drugs are effective against. Dihydrostreptomycin is a derivative of streptomycin that has a bactericidal property. It's a semisynthetic aminoglycoside antibiotic used in the treatment of tuberculosis. Pen-Strep is a mixture of penicillin and streptomycin widely used in mammalian cell culture media to prevent bacterial contamination. The solution contains 5,000 Units of Penicillin G which acts as the active base, and 5,000 micrograms of Streptomycin (sulfate), formulated in 0.85% saline. In general, 50-100 Units of Pen-Strep per milliliter of media is used to avoid contamination in cell culture. Thus, the retail product is generally 100 X more concentrated. It is recommended for use in cell culture applications at a concentration of 10 ml per Liter. It is the most common antibiotic solution for the culture of mammalian cells and it does not have any adverse effects on the cells themselves. It is first introduced in 1955 in cell culture. Elizabeth Bugie Gregory was an American biochemist who identified Streptomycin, an antibiotic that was active against Mycobacterium tuberculosis. 1 2 Zhu M, Burman WJ, Jaresko GS, Berning SE, Jelliffe RW, Peloquin CA (October 2001). "Population pharmacokinetics of intravenous and intramuscular streptomycin in patients with tuberculosis". Pharmacotherapy . 21 (9): 1037–1045. doi:10.1592/phco.21.13.1037.34625. PMID 11560193. Archived from the original on October 5, 2011. Retrieved May 25, 2010. 1 2 3 4 5 6 7 8 9 "Streptomycin Sulfate". The American Society of Health-System Pharmacists. Archived from the original on December 20, 2016. Retrieved December 8, 2016. 1 2 3 4 5 6 WHO Model Formulary 2008 (PDF). World Health Organization. 2009. pp. 136, 144, 609. ISBN 9789241547659. Archived (PDF) from the original on December 13, 2016. Retrieved December 8, 2016. ↑ Torok, Estee; Moran, Ed; Cooke, Fiona (2009). Oxford Handbook of Infectious Diseases and Microbiology. OUP Oxford. p. Chapter 2. ISBN 9780191039621. Archived from the original on September 8, 2017. ↑ Renneberg, Reinhard; Demain, Arnold L. (2008). Biotechnology for Beginners. Elsevier. p. 103. ISBN 9780123735812. Archived from the original on September 10, 2017. ↑ "WHO Model List of Essential Medicines (19th List)" (PDF). World Health Organization. April 2015. Archived (PDF) from the original on December 13, 2016. Retrieved December 8, 2016. ↑ "Streptomycin Sulfate". International Drug Price Indicator Guide. Retrieved December 8, 2016. ↑ Qian H, Li J, Pan X, Sun Z, Ye C, Jin G, Fu Z (March 2012). "Effects of streptomycin on growth of algae Chlorella vulgaris and Microcystis aeruginosa". Environ. Toxicol. 27 (4): 229–37. doi:10.1002/tox.20636. PMID 20725941. ↑ Reilly HC, Schatz A, Waksman SA (June 1945). "Antifungal Properties of Antibiotic Substances". J. Bacteriol. 49 (6): 585–94. PMC 374091 . PMID 16560957. ↑ Prayle A, Watson A, Fortnum H, Smyth A (July 2010). "Side effects of aminoglycosides on the kidney, ear and balance in cystic fibrosis". Thorax. 65 (7): 654–8. doi:10.1136/thx.2009.131532. PMC 2921289 . PMID 20627927. ↑ Syal K, Srinivasan A, Banerjee D (2013). "Streptomycin interference in Jaffe reaction — Possible false positive creatinine estimation in excessive dose exposure". Clinical Biochemistry. 46 (1–2): 177–179. doi:10.1016/j.clinbiochem.2012.10.031. PMID 23123914. ↑ Sharma D, Cukras AR, Rogers EJ, Southworth DR, Green R (December 7, 2007). "Mutational analysis of S12 protein and implications for the accuracy of decoding by the ribosome". Journal of Molecular Biology . 374 (4): 1065–76. doi:10.1016/j.jmb.2007.10.003. PMC 2200631 . PMID 17967466. ↑ Voet, Donald & Voet, Judith G. (2004). Biochemistry (3rd ed.). John Wiley & Sons. p. 1341. ISBN 978-0-471-19350-0. ↑ Comroe JH Jr (1978). "Pay dirt: the story of streptomycin. Part I: from Waksman to Waksman". American Review of Respiratory Disease . 117 (4): 773–781. doi:10.1164/arrd.1978.117.4.773 (inactive 2019-02-15). PMID 417651. ↑ Wainwright, M. (1990). Miracle Cure: The Story of Penicillin and the Golden Age of Antibiotics. Blackwell. ISBN 9780631164920. Archived from the original on September 10, 2017. Retrieved December 29, 2014. ↑ Wainwright M (1991). "Streptomycin: discovery and resultant controversy". Hist Philos Life Sci. 13 (1): 97–124. PMID 1882032. ↑ Kingston, William (July 1, 2004). "Streptomycin, Schatz v. Waksman, and the balance of credit for discovery". Journal of the History of Medicine and Allied Sciences. 59 (3): 441–462. doi:10.1093/jhmas/jrh091. ISSN 0022-5045. PMID 15270337. ↑ Schatz, Albert; Bugle, Elizabeth; Waksman, Selman A. (1944), "Streptomycin, a substance exhibiting antibiotic activity against gram-positive and gram-negative bacteria", Experimental Biology and Medicine, 55: 66–69, doi:10.3181/00379727-55-14461. 1 2 3 Ryan, Frank (1993). The forgotten plague: how the battle against tuberculosis was won—and lost. Boston: Little, Brown. ISBN 978-0316763806. 1 2 D'Arcy Hart P (August 1999). "A change in scientific approach: from alternation to randomised allocation in clinical trials in the 1940s". BMJ. 319 (7209): 572–3. doi:10.1136/bmj.319.7209.572. PMC 1116443 . PMID 10463905. ↑ Metcalfe NH (February 2011). "Sir Geoffrey Marshall (1887-1982): respiratory physician, catalyst for anaesthesia development, doctor to both Prime Minister and King, and World War I Barge Commander". J Med Biogr. 19 (1): 10–4. doi:10.1258/jmb.2010.010019. PMID 21350072. ↑ "New Jersey S3190 | 2016-2017 | Regular Session". LegiScan. Retrieved November 29, 2017. ↑ "New Jersey A4900 | 2016-2017 | Regular Session". LegiScan. Retrieved November 29, 2017. Mistiaen, Veronique (November 2, 2002). "Time, and the great healer". The Guardian. . The history behind the discovery of streptomycin.